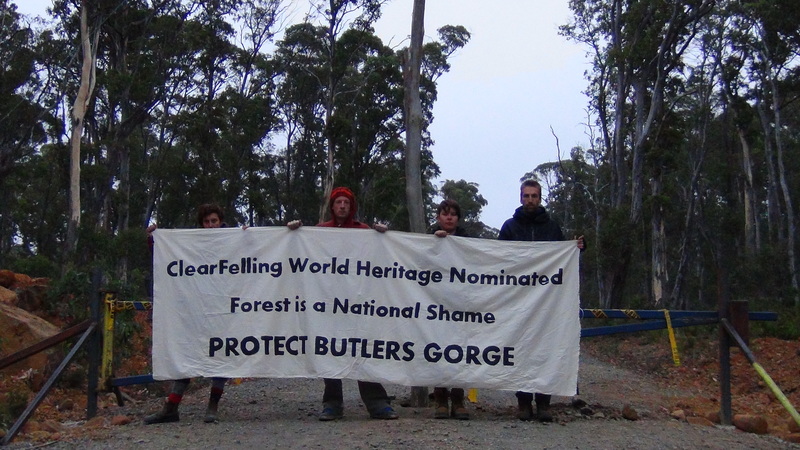 Media Release: A second day of protest halts logging at World Heritage nominated Butlers Gorge. Today Still Wild Still Threatened has taken action at Butlers Gorge for the second day in a row. Yesterday protesters successfully halted logging operations in three separate logging coupes. Police arrested one protester yesterday afternoon and dismantled structures that blocked access to the logging road. This morning the logging is halted once again by a structure attached to a tree sit. One person is in the tree sit and 15 others are on the logging road. “Conservationists are stopping logging for a second day today, because it is absolutely critical that the chainsaws stop in these World Heritage nominated forests” said Miranda Gibson, spokesperson for Still Wild Still Threatened. “Three weeks ago when Minister Burke announced the outstanding universal values of these forests were worthy of World Heritage protection there should have been an immediate cessation of logging. This did not happen” said Ms Gibson. “Stopping logging in World Heritage nominated forests should not be left up to the community. But unfortunately in the wake of Tony Burke’s deplorable neglect of these forests, conservationists have had to step in and hold the chainsaws at bay in order to try and protect very values for which these areas have been nominated” said Ms Gibson. “As a conservationists, members of Still Wild Still Threatened cannot stand by and watch as some of Tasmania’s most precious forests carted away on the back of log trucks at a time when they should have been safe. We will continue to take action to end the destruction in these World Heritage nominated forests” said Ms Gibson. “The message is clear: Tony Burke, enough is enough. You’ve nominated these forests, now protect them” said Ms Gibson. Posted on February 21, 2013, in Media Releases. Bookmark the permalink. 1 Comment. The ALP should be ashamed, for nominating an environment minister who clearly is more interested in lining the pockets of loggers, rather than doing his job! Tony Burke you are the environment minister, not the forestry minister! DO YOUR JOB !! !